This week’s Monday Ballard Paddling Race was challenging to many due to varied and changing conditions as well as from an error from your race director (me) per the rock turn direction. Here’s a few tips on improving your performance..
Seasoned races have experience in this area and often practice beach starts. I was impressed how many really took off as soon as they got on their boards. I tried to draft one but he was gone, no chance! A common issue in starts is being jammed up next to other racers. Paddles and boards collide, and racers fall not used to the considerable white water created by 30-40 water craft taking off at once. – Learn to Deep Feather as I call it. On your recovery stroke or feather, instead of bringing the blade above the surface to your catch, instead leave it in the water with the paddle shaft still vertical (upper hand over water) drawing the power face forward parallel to your hull to the catch. 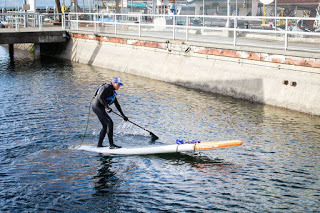 This allows you to paddle in a tight space without taking your blade out of the water. Also useful along cliffs, next to walls or docks. And also a great tool in rough water and in buoy turns for more stability. I use it often. – Short Cadence. If you’re not a regular racer or paddler, short quick strokes (to your toes) will help you accelerate quicker to get up to race speed and keep you more stable in all that white water. Longer strokes past your feet or beyond, will be a slow start and you’ll be less stable on bumps. – Pick your Line. Many seem to get into the race line-up without a plan on where to go next. In the case of our red buoy and a light NE wind (blowing right to left) it makes sense to paddle slightly to the right of the bouy to avoid having the wind push you too far left, thus making your buoy turn more work. Makes more sense to do a mild 90 degree or less turn vs a 180 degree turn. – Use the Sweeping Brace to stay stable in the white water. One way is to line up on the right side of the race start, this also will be less crowded and give you a chance to break away from the pack to find your own line. Stay right up slightly upwind and allow the wind to push you to the buoy vs past it before your turn. Avoid thinking you need to be in the pack. The pack doesn’t always know the best way and besides, it’s their goal to beat you. In last night’s race, we timed the start for racers to encounter the 3′ purse seiner wake after your start. One racer described racers going over the wake as ‘like bowling pins going down’. I could hear splashes behind me. When you approach a wake from any direction, bend your knees more, use a very short cadence and don’t stop paddling! I saw one in front of me raise their arms to the air as soon as they hit the wake, then fall in. This raises your center of gravity and usually results in a swim. Instead, get low, paddle hard and fire over the top of the wave. For fun I try to approach with enough speed sort jump the wave – never happens but fun to try and gives you a goal for paddling vs stalling on waves. – Bend knees (sometimes a lot), use a short cadence (to toes) to stability. – Don’t freeze on the wave, paddle! – Don’t try to balance like on a tight rope – paddle. Paddling is stability. – If the wave is knee to waist high or higher step back (one foot) to raise you nose over the top. Many over do stepping back. You don’t need to do 2-3 steps back, just a touch. – Try a Sweeping Brace instead of feathering above the surface. After your stroke, slide the blade face over the water surface toward the catch like a hydroplane (power face and leading edge up). You get a ton of stability doing this. I use it often in rough water, side chop, reverb and as an outrigger surfing race boards. A common element of our races is waves hitting you at your side or from 2-3 directions as a result of a waves bouncing off a wall or cliff often called Reverb, but in nautical terms called Clapotis. – Bend knees, sometimes a lot. Think shock absorbers. Too often I see paddlers standing straight up. – Sweeping Brace (or see above) on your recovery. ie: feather on surface of water not above. – Relax. Tense means you’ll get stiff and fall. Relax every bone and joint in your body. Loosen your grip on the paddle. Make sure to smile and enjoy the funky ride. – The Deep Feather works well for both as well to keep you locked in with more stability. Taking your blade out or above the water means you’ll lose stability. I try to stay 100% connected to the water throughout the stroke. Reverb isn’t always a bad thing. Sometimes there’s little surf waves in there that can push you along. I once nearly surfed a series of wall bounce back for the entire length of the Montlake cut. Like downwinding, you can find a line or a way through it vs thinking the whole thing is a problem. Avoiding it by going off shore lengthens your race. Where to Look – Don’t forget to enjoy the scenery. Look around, avoid a dead pan stare to the racer in front, the finish line or your board. It’ll give you a little break, then get back to it.. I surf every wave I see. Whether it’s ankle or larger, I’m on it. Waves give you a little push, make a long slog of a race more fun and if you get a ride, often you’ll surf faster than you can paddle thus pushing you closer to or ahead of the racer next to you. Sometimes small waves become bigger waves. See Blue Planet’s downwind guide on using on-ramps to catch waves. On many of our races, I see racers paddling though vs surfing boat, wind and reverb waves. You choice, work hard or get a free ride. 6 Tips on Catching Waves / Glides..
– Pay attention to every bump. You want to get in the trough or bottom of the wave which may require speeding up to an enticing wave ahead of you. I’m looking 360 degrees at all times looking for opportunities. – If you can’t drop in, walk or step up on your nose to push your nose in (nose riding). Learning forward does this too without having to step forward then back. Wax your nose if slippery. Watch more about leaning in this Blue Planet Surf’s video. – Control in a wave – Use a rudder stroke (blade at tail) and nose rudder or dufek. – Use the sweeping brace when surfing down the face for more stability. Like an outrigger. Often the most popular topic but also a weak point for many paddlers. Every turn is different so don’t get stuck practicing around one buoy the same way. Practice in all conditions and with friends to simulate several coming in at once (can get interesting). – Try both the pivot (step back) turn and cross bow – in both – Get Low. I see a ton of paddlers standing up on these. The lower you get, the paddle gets shoved out further thus creating more leverage and more stability for you. Try getting sup low (squat). – Change your stance. If your stance around a buoy means your left foot back for a left turn, try instead to put your right foot back. And vice versa for the other direction. – Look where you’re going. If you keep your eye on your destination, all will work better. Your body will naturally turn and turn the board in the direction you’re going. That means less work. If you’re looking straight and not at your destination, your body will be stiffer thus requiring more work. When you do the cross bow, if you paddle crosses the nose to your left side – look left. – Use waves to round a buoy. Last night an incoming swell coming at me allowed me to use the rise of the wave to swing my nose around. So try to time for a waves coming in, maybe slow a bit to get one. As soon as it lifts your nose, sweep turn on the opposite side of your turn allowing the wave to swing your nose around the buoy in the direction the wave is going. A lot easier than a flat water turn with less effort. If done right you can turn the board with 1-2 strokes vs a half dozen required for most pivot (or step back) turns. – Surf around the Buoy. Similar to the above technique. If you’re downwinding or surfing a wave into a buoy, time it to make your turn as soon as the wave begins to pass the buoy by surfing down the face at an angle then back over the top of the wave around the buoy. Or if it’s just a 90 degree turn, surf around half the buoy and continue surfing the wave. I got a sweet ride around the big rock a few weeks ago – just slid by it and continued along the bluff without working a bit. Test by going out on a windy day and learn to time the waves around obstructions. – Get back before you get to the buoy. Instead of stepping back right at the buoy, take a step back or two before you get there, the recover to center 1-2 steps after you pass it. Maybe one step, keep paddling. Then another, keep paddling, then turn, then recover with one step, then another. Doing it all at once takes effort and you lose a lot of speed. – Try a Static Cross Bow vs a pivot (step back) turn. This means when you place the blade in the water across from your nose – Hold it there vs pulling it into your nose. It’s essentially a nose rudder. Can only be done while you’re moving. Then let the board spin around the fixed blade. This way you can do a 90 degree turn with one stroke without losing much speed. The pivot usually kills most of your speed, it’s essentially a brake when you jam the tail into the water. – One Step Back – Try doing your turns especially the cross bow with only one step back (either both feet back or one behind the other). I paddle with my feet staggered, one slightly back at all times. Then when I need to step back, the behind leg goes a bit further back, just enough to raise the nose out, then quickly step back to paddle. Quicker then fully stepping both feet back then recover. Avoid the full surfer’s stance in turns. I see folks on occasion standing with both feet wide apart and both facing the same rail at 90 degrees. Really hard to get into and recover thus slowing your turn, recovery to building up speed after the turn. And often they fall in, as it’s super tippy. When you’re fried and start slowing or getting sloppy. Think about the basics. Re-start doing a perfect forward stroke, make sure your lower arm is straight, hands loose, you’re reaching out, all looks good. Relax (vs getting tense), re-start your breathing, enjoy the scenery, then charge to the finish. *Got beyond the norm. I’ve been testing stepping forward (vs back) to push the nose down to go round buoys. Getting pretty wet but interesting results. We have intermittent boat traffic during our races. Boats have right of way over us so give them the right of way. Racing to beat the bow of a boat isn’t a good plan. Tonnage vs donage. That boat that seems to be cutting off your line might also give you an unplanned surprise such as a boat wake to pass the racer at your side or that may capsize the racer at your side who doesn’t like waves. If a boat is parallel to our course, use it’s wave to propel you ahead. Practice surfing boat wakes on your own time to learn how to work it in those conditions. That’s something we do regularly in front of the Elks. – Downwinding is hot but usually most max their skills out as they’re only surfing downwind, vs side or upwind (unless you’re not doing shuttles). Learn to surf coastal or freighter waves which will help you paddle out over waves, take waves from the side and turn down a wave face. Our next class is 9/23 or 24 (date and location dependent on conditions). I can teach you how to downwind too, just harder to schedule wind. We’ll lose our low tides for freighters in the Fall so will change our local wave focus to tugs and wind waves. – Deception Pass Tidal Rapids – The ultimate place to conquer side chop and reverb and overall wacky water. Imagine 1′ tall boils rising up on 2 sides at once, whirlpools spinning you in a circle (not down), 360’s while crossing eddy lines and surfing a boat wake over super super funky water. We’ll teach you how to read the water to make the best decisions to get you there. And have fun. – Check out Robert Stehlik’s Blue Planet Surf videos. He covers great topics with detail. – Dress for immersion and be willing to get wet. Push yourself, try new things (not just trending things).